Jocelyn and I headed over to the Sheraton Petaling Jaya Hotel recently to try out their new Weekend High-Tea Buffet at Feast – the hotel’s all day dining restaurant located on level 3 of the newest hotel in Petaling Jaya. The interior of Feast features a streamlined, contemporary setting enhanced with interesting Asian elements, inspired by the bright and cheery colours that encourages the building of appetite when dining. The restaurant has indoor seating that seats 160 pax complemented by a live show kitchen and well-lit buffet counter. The open kitchen showcases the art of cooking such as wok frying and pizza twirling, as the chefs ensure that the spread of food is constantly topped up with a fresh batch whenever it’s running low. 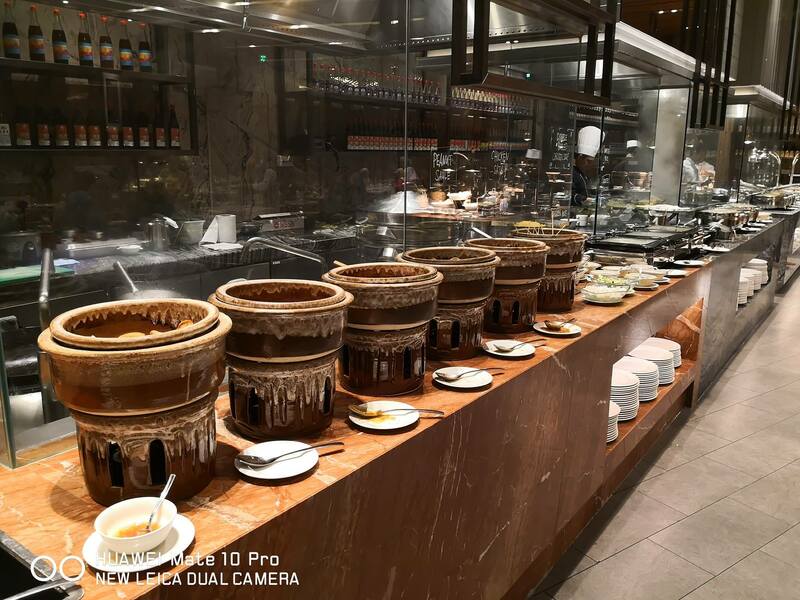 The buffet is themed “Going Local”, and has a variety of local all time favourites such as Kari Sotong Nyonya, Double Boiled Chicken with Herbal Soup, Chee Cheong Fu, Yong Tau Foo, Kung Pao Lala, Portugese Egg Tart, Prawn Vindaloo and Nasi Lemak with Ayam Rendang and more. To be honest, I really prefer these kinds of buffet high-teas rather than the tiered trays of sugar filled desserts which girls order as they want to post on their Instagram to show off. This one is an actual meal which has a multitude of dishes across various cuisines – Malay, Chinese, Indian and Western! If you like seafood, there’s a fresh seafood section with fresh yabbies, mussels, prawns, etc. etc. and I must say that at this price (refer below), it’s really a good value for money buffet high-tea! The buffet is priced at RM88 nett per adult and 50% off for children age from 5 to 12 years old. The buffet runs from 12noon to 4.00pm on weekends. Sheraton Petaling Jaya hotel celebrates the mid-autumn festival with specially prepared delicious treasures to honour this celebration of unity and togetherness with beloved friends and family. This is the first year that Yue Restaurant, Sheraton Petaling Jaya joins the mid-autumn festival, offering exclusive mooncake boxes with choices from 6 different traditionally baked mooncakes. Among the flavours are Baked Durian with Single Yolk, Pandan Paste with Single Yolk, Pure Lotus Paste, Red Bean Paste, White Lotus Paste with Single Yolk and Mixed Nuts (which can be purchased individually priced from RM26nett per cake). These exquisite mooncakes are ideal as gifts for business partners, friends and family, and come in an intricately and beautifully designed boxes with individual elements of Plum Blossoms, Butterflies and Peacock. 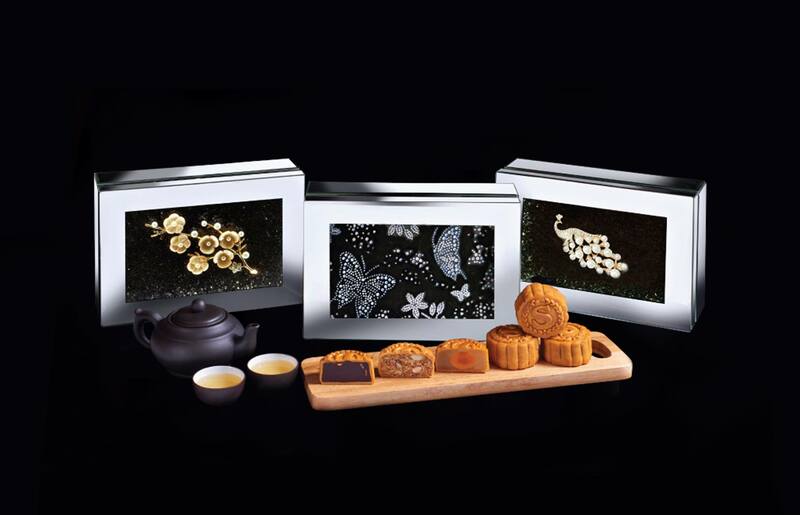 Each gift box is priced at RM158nett inclusive of four (4) mooncakes of your choice. The beautiful box can be used after the festival as a jewellery box to keep your accessories and jewelry. Along with the mooncakes, Chef Ben Lim – Sifu of Yue restaurant kitchen has prepared two (2) different 8-course menus; the Golden Fortune menu priced at RM1,888 and Precious Jewels menu at RM1,288 per table. Chef Ben has included in the menus, some of his signatures dishes like the Pan Fried Chicken topped with Salted Egg and Barbecue Sauce, Fried Prawn Meat with Lotus Root and Macadamia Nuts, Double Boiled Chinese Herbal Soup, Steamed Dragon Grouper and Pan Fried Australian Lamb Rack with Angelica Herbs. The mid-autumn festival menus and mooncakes are currently available from now until 24 September 2018. The photos above were shot with the Huawei Mate 10 Pro (not the photo of the mooncakes of course which was courtesy of Sheraton Petaling Jaya Hotel). 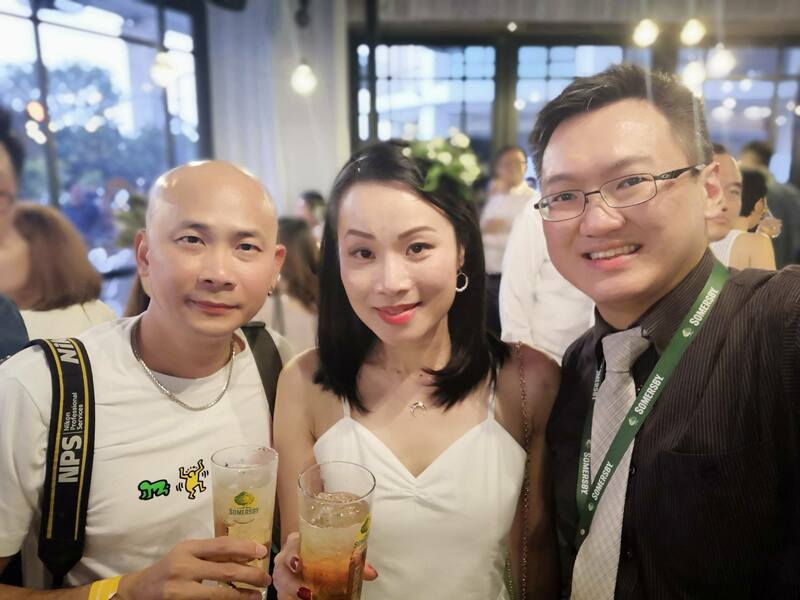 MHB’s Andy Kho and I headed over to Morganfields in USJ on 17 August 2018 for the launch of the new Somersby Elderflower Lime. The new variant is best served over ice, and is infused with floral notes combined with a twist of lime, making it a very refreshing cider indeed! The Elderflower is the white blossom of the Elderberry tree. Its delicate and subtle lacy white flowers are attributed with medicinal properties and is frequently used for flavouring food and drinks in Europe. 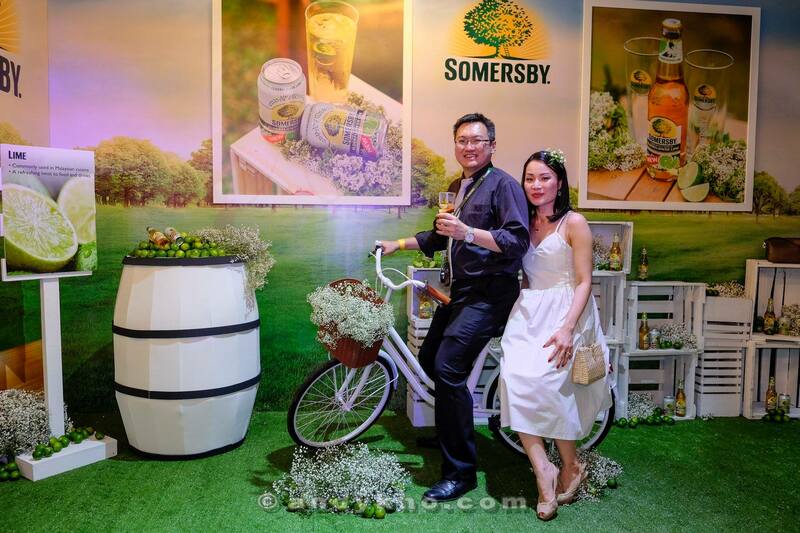 Now I was there right at the start when Somersby was first launched in Malaysia back in 2012 at the Carcosa Seri Negara (which you can read here – https://timchew.net/2012/06/25/somersby-apple-cider-launch-at-carcosa-seri-negara-220612/) and through the years (you’ll find the entire history of Somersby cider in Malaysia here – https://timchew.net/?s=somersby and no, in case you were wondering – I don’t work for Carlsberg Malaysia which owns the brand here in Malaysia), there have been new additions to the Somersby cider family. Of course, I have my favourite among all the variants which is Somersby Pear – as it’s the least sweet among all the variants and is incredibly refreshing. 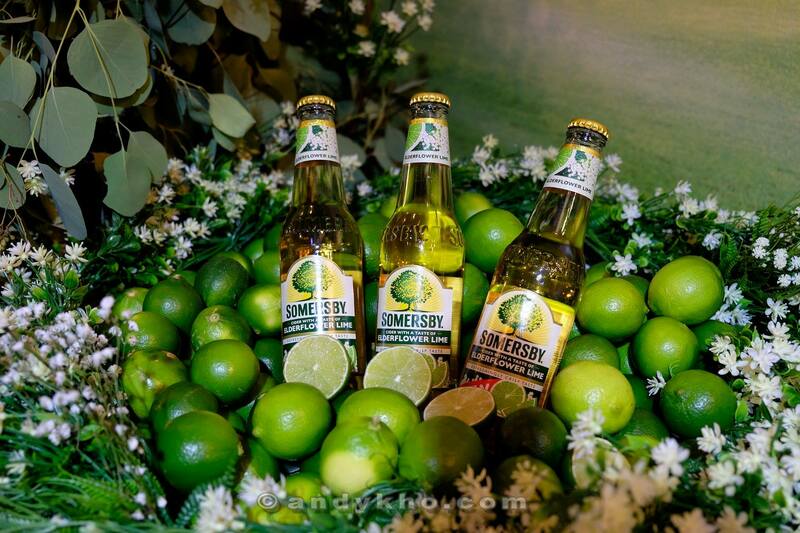 The new Somersby Elderflower Lime is now my second most favourite with its well-balanced taste which is neither too sweet or sour, complemented with just a hint of floral notes as not to overpower your palate. It made one very refreshing drinks and as it was a blazing hot evening, this cider was perfect to cool down with! The launch was an all-white-themed (yes I was being rebellious) evening of good food and cider, in casual elegance with Scandinavian-style garden decor, white Elderflowers everywhere, especially the flower tunnel where many guests took selfies in. 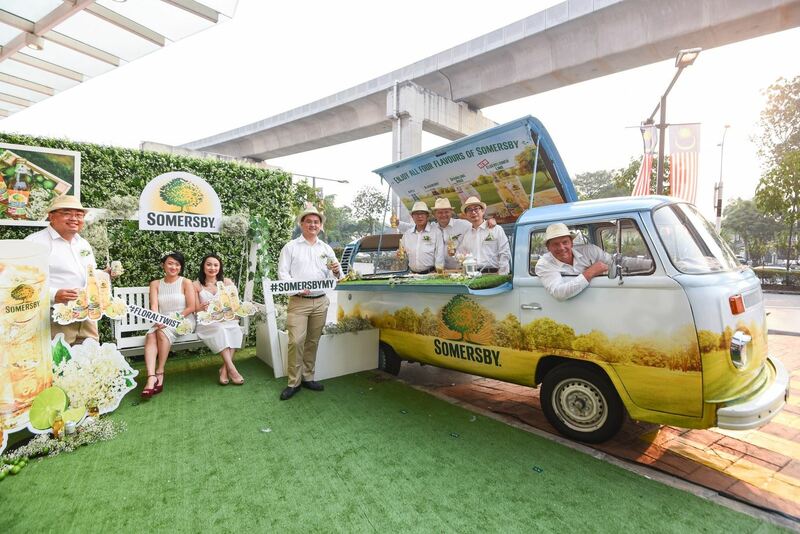 To promote the Elderflower Lime variant, the Somersby Kombi mobile bars will be making month-long roving visits in September to local tourist spots, night markets, supermarkets and hypermarkets around Peninsular Malaysia offering consumers a chance to sample Somersby Apple, Blackberry, Sparkling Rosé and the new Elderflower Lime. You can also get a can of Somersby Elderflower Lime FREE with every purchase of a 4- can or 4-bottle pack at participating hypermarkets, supermarkets and convenient stores from 27 August to 30 September. This deal is also available for the 6-can pack Carlsberg or Carlsberg Smooth Draught. There will be special food promotion at 100 participating F&B outlets from 1 September to 31 October where there are special promotions for the Somersby Elderflower Lime. If you’re dining at Morganfield’s, try the Baby Back Ribs promotion paired with the Somersby Elderflower Lime. The Somersby Elderflower Lime, in 4.5% alcohol content, is available in bottle (330ml) and can (320ml) at major hypermarkets and supermarkets nationwide. You can also head over to http://www.winetalk.com.my to get the Somersby Mystery Box set worth RM50 comprising ALL FOUR flavours at only RM35! Andy and me with Carlsberg Malaysia’s HR Director Felicia Teh. Thanks for having us! 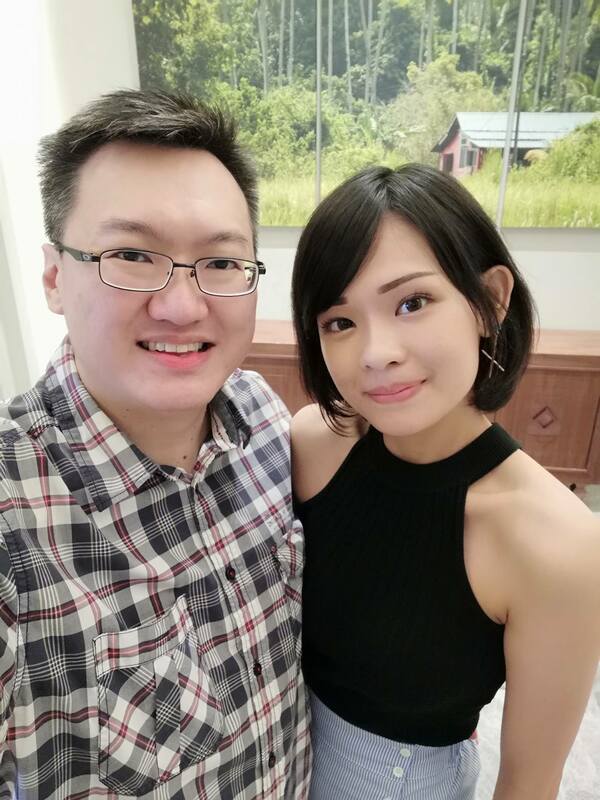 Photo credits: Andy Kho Photography, Carlsberg Malaysia, and author’s own using the Huawei Mate 10 Pro.